I saw these super cute felt princess finger puppets being featured over at UCreate Kids. These would be such a cute homemade Christmas gift. In fact, I am pretty sure each and every one of my nieces needs a set of these for Christmas. The girls can even help me make them and it can be their gift to them. 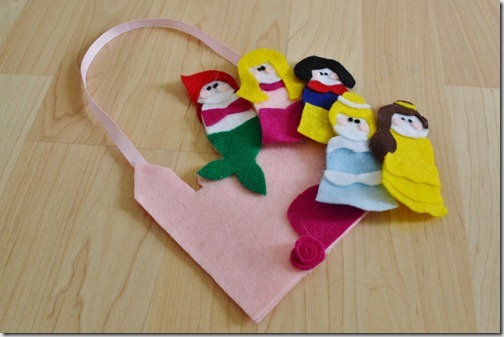 You can get the free felt princess finger puppet templates over at Made It on Monday. Thank you so much for the feature! Have fun making them! Jill, they are ADORABLE! And I really feel like I could pull them off! Thanks for the patterns!